just a tidbit for all who work with Angels. March 24th we celebrate the "Feast Of St Gabriel." Gabriel sits @ the left-Hand Of God. Is said by some to be the 2nd most important Archangel. Angels are considered to be neither male or female, however Gabriel is usually pictured as a female. However Gabriel can appear in masculine form. Considered to be God's envoy to mankind, Gabriel represents overcoming doubts & fears. Element: Water, Direction: West, Season: Winter, Color: Emerald Green. Zodiac signs: Cancer, Scorpio, and Pisces (the water signs). Blessed be to St. Gabriel. In the Catholic Church, there is also a Feast Day for all Archangels, celebrated on September 29th. 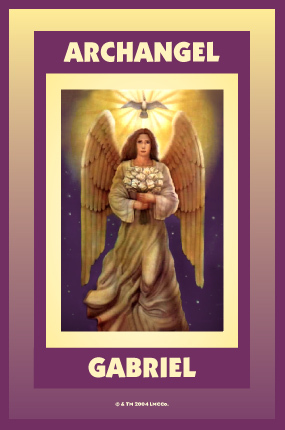 Archangel Gabriel is the angel of communication, music, dreams, visions, writing, conception, pregnancy, and childbirth. 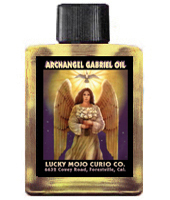 Lucky Mojo has several products dedicated to St. Gabriel, including oil, powder, incense, bath crystals, and a vigil candle. What is an appropriate offering to Archangel Gabriel? We had been trying for years to have a baby. We just couldn't make it go. Angels are the common ground between my spiritual beliefs and my wife's Catholicism. We set up a Gabriel altar (due to association with the moon) with statue, candle, carved glass sigil tea light holder, etc. and everything worked out for once. I would get after her to light the candles and anoint the statue every day. Logan was born a week ago yesterday. What a beautiful story, thank you for sharing! And congratulations on your new baby! Thank you Archangel Gabriel for helping me in a situation where communication was a problem. Thank you again Archangel Gabriel for hearing my prayer and re-opening communication. I love you. Thank you Archangel Gabriel for helping me once again. And thank you LM for making Archangel Gabriel supplies smell so amazing!